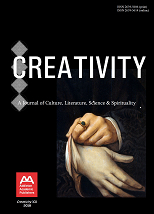 Creativity is domain-specific (hence “artistic creativity” in the journal title) and, at least for sound linguistic reasons, nation-specific (hence “Romanian” in the title). An age-old, philosopher- and theologician-friendly concept, covering fields like poetry, fiction, painting, sculpture, nonfiction, architecture (drawing and building), music (composing and performance), theatre (writing and performance), artistic creativity will come in a fresh perspective today only if it comes complete with psychology and psychiatry, also with such newcomers on the scene as genetics and biochemistry. All such dimensions considered, we will hopefully have a say in the matter, and our voice will be firm enough to ensure us a distinct position in international literature.